The SEC’s Claims Review Staff (“CRS”) found that Claimant #1 provided original information to the SEC that led to the successful enforcement of the SEC’s action. An SEC press release identified Claimant #1 as “a former company employee”. The CRS issued a Preliminary Determination recommending that Claimant #1 receive a $ 17 million SEC whistleblower award. 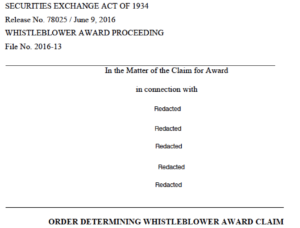 For various reasons, the CRS recommended not granting SEC whistleblower rewards to the other claimants. In its Order, the Commission adopted the CRS’s recommendations and granted Claimant #1 the $ 17 million SEC whistleblower award. At the time, this was the second largest reward granted under the SEC whistleblower program. The Commission’s Order recited certain factors that contributed to its granting the $ 17 million SEC whistleblower award. For example, Claimant #1 properly submitted his or her information on the SEC’s Form TCR, as required by the SEC whistleblower rules. In addition, after submitting the Form TCR, Claimant #1 had subsequent communications with the SEC in which he or she “provided additional information of which Enforcement staff were previously unaware that substantially advanced their investigation” and, according to the SEC’s press release, the “ultimate enforcement action”. The Order described the information that Claimant #1 submitted as both “detailed” and “critical”. In a redacted sentence, the Order stated that Claimant #1 did something “early”. While it would only be speculation, it is possible that the redacted portion was referring to providing the information to the SEC early on, rather than delaying reporting it. Whatever it was that Claimant #1 did early, it “allowed Enforcement staff to conserve time and resources in the investigation, and helped staff to gather evidence supporting the Commissions charges” against the violators. 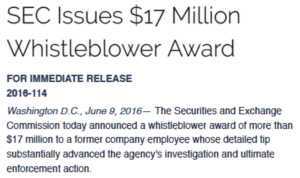 In a press release about the $ 17 million SEC whistleblower award, the Director of the SEC’s Division of Enforcement added, “The information and assistance provided by this whistleblower enabled our enforcement staff to conserve time and resources and gather strong evidence supporting our case”.